The name you will use as a GM/DM. This is also what shows in the game log. Your campaign name, selected from your list of campaigns. Opens a dialog for you to manage your campaigns. From here you can select, create a new campaign, or delete an existing campaign. This is the session name for your game that will show up on the list for players to pick from. Your game session password goes here. This keeps unwanted people from randomly joining your game. The port used by the session. You should not need to change this. The System Reference Document you would like to use for your game session. Enable Over-sized Interface -- for use with touch screens to make menus and GUI easier to navigate. Enable TCP/IP Networking -- Unlocks Direct Connection IP and Port fields lower down on the screen. Please note; You can not mix connection methods. Everyone (including the host) must either use the new Sessions method or the direct TCP/IP method. 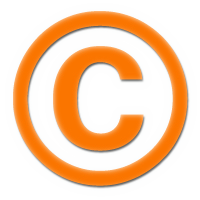 Used for Direct Connections. You will need to provide your players with this Port Number. 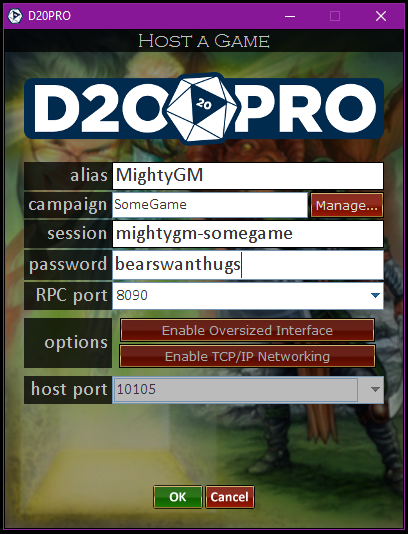 You can find this information from within D20PRO by going to Main Menu -> Options -> Network\App -> Get IP Address. For people connecting locally (same Lan) give them your Lan IP (assigned to your local machines by your router) address. For people connecting remotely (Not Local) give them your Wan IP (assigned by your ISP to your router) address. Several things have to happen in order for Direct Connections to work correctly. You have to provide accurate information to your players. You will also need to 'port forward' the port used via your router. You may also need to allow access via your PC firewall. Each router and/or firewall is different. If you Contact Support for help with Direct Connections, please make sure to include information on the Operating System used, the Make & Model of your router, any Firewall or Security Suite software you are using along with version numbers. If you are using TCP/IP direct connections you may find using Beacon easier than fighting wtih Firewalls and Routers. Processes the launch parameters and tries to connect with the given information. Cancels the operation and goes back to the main Launcher screen.